you were sprawled across centuries with chivalry alive in your lungs and burning on your tongue, gently braided in perfect harmony with the god's wishes. someday i'd like to ride on the whitecaps, thrown in tune with the rays of the sun and the blinking of your eyes, and just think to myself how damn lucky i am to be here on this earth in the same millennium as you. encasing my bird's voice and your grizzly bear growls in sparkling amber, we were fossilized against the sands of time wearing away at our carelessly scattered thoughts. cherish the night, there are only seven hundred and sixty left. Ahhhh... Thursday. With poetry that beautiful, it almost feels like a TGIF day, when you can almost taste the weekend. Almost. Browsing through some old cookbooks, I came across a Pillow-Soft Dinner Rolls recipe that brought me to a pause. If the name itself wasn't already enough to win me over, then the simple baking method had me completely. To be honest, I'd never made rolls that weren't a bit on the crusty side. That's probably because I like my rolls rustic rather than dining-parlorly genteel and sophisticated, or maybe I hadn't come across any enticing soft rolls recipe. Until today. Of course, being the person I am, the thought of just rolling dough into plain round balls didn't exactly light my fire. But the idea of adding chocolate and ginger flavors to the rolls did! (The third flavor is plain - just in case). The flax seeds were only in there because I'd run out of eggs. They worked out well as an egg-substitute and even added a slightly nutty flavor to the bread. Okay, now here comes the overkill. Since this was essentially a sweet bread, I thought it'd be fun to pipe some caramel fudge left over from another recipe into the centre of the bread. Well, that didn't work out too well as the filling then started to ooze out while the dough was into its second rising, and proceeded to dry up during baking. On hindsight, I should just spread the caramel fudge atop the hot rolls as they came out of the oven. Oh well, lesson learnt. The rolls were as pillow-soft as their original title, even with no eggs. The texture was light, airy and the flavors worked well together, yes even with the (caramelized) caramel fudge. When would you eat this? With friends and family, over a cup of coffee, tea or hot chocolate. Or alone, while typing up your blog post like I'm doing right now. Shoot, my keyboard's all greasy, but the pleasure... aaahhhh. 1. In a large mixing bowl, dissolve yeast in warm water. Add the butter, flax seeds, sugar, salt and flour. Add the milk gradually and knead with your hands or using a dough hook attachment to form a soft dough. 2. Turn onto a floured surface; knead until smooth and elastic, about 6-8 minutes (until dough is no longer sticky). Divide dough into 3 equal portions, leave one portion plain. Take another portion and knead in the ginger powder. To the last portion, knead in the cocoa powder until fully incorporated. 3. Form dough into balls and place each in separate, greased bowls. Cover and let rise in a warm place until doubled, about 1 hour. 4. Punch dough down. 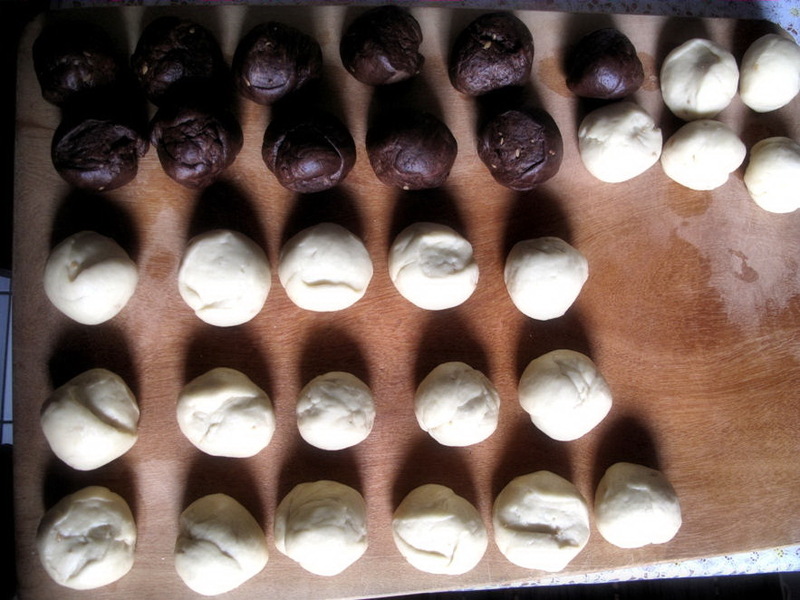 Turn onto a lightly floured surface; divide each portion into 10-12 pieces and shape into small balls. Position the 3-flavored balls into a greased, lightly floured muffin cup. Pipe filling into the middle of the roll. Cover and let rise until doubled, about 30 minutes. Bake at 180C/350F for 20-25 minutes. 5. 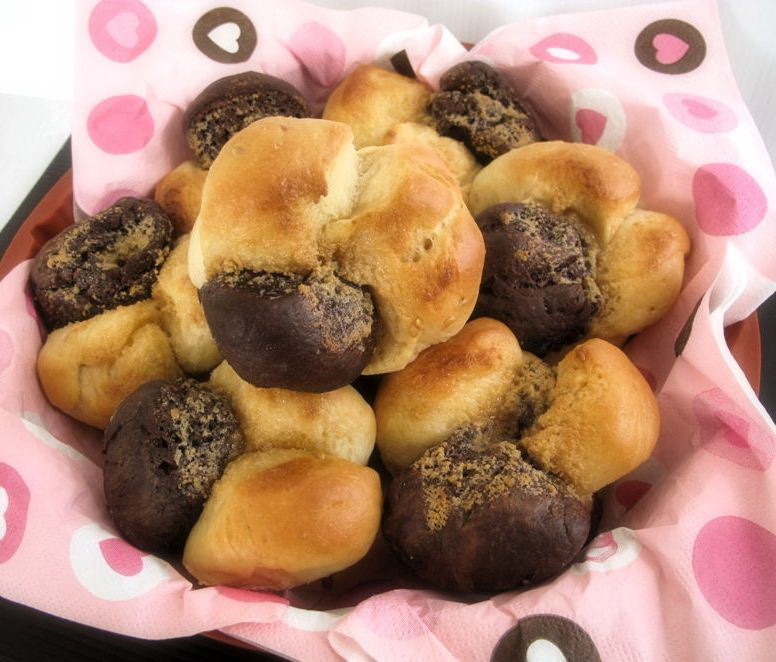 Brush tops of rolls with softened butter as soon as they come out of the oven. Turn out of pans and leave to cool on wire racks. 1. Bring sugar and milk to a boil, stirring constantly; boil, covered 3 minutes. Then remove lid and boil uncovered, until a small amount forms a soft ball when dropped into cold water (234 - 236F), stirring occasionally. 2. Remove from heat and add butter, salt and vanilla. 3. When lukewarm, whisk until mixture is thick enough to pipe or spread. Holy cow. This is freaking genius. I LOVE the sweet dollop of caramel fudge you squirted in there. I'm drooling!! Kind of love that you added flax seeds in there to make it...uh, nutritious, too. Hee hee. these are pretty awesome--i've never thought of doing multi-flavored rolls. i can see myself chunking together garlic, chive and cheddar ones. S, your savory combination sounds wonderful! In fact, I might give that a try next!